It's starting to look a little more like spring around here. Today, will be a beautiful, sunny 59 degrees. That makes me want to start cleaning up the gardens and getting things ready for planting. 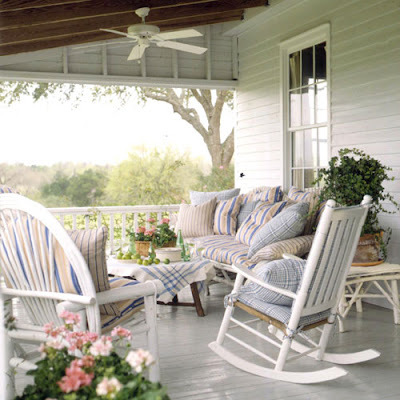 Or maybe, get the porch all prettied up, sit in my rocking chair, and read a good book. ...enjoying a snack while I read. 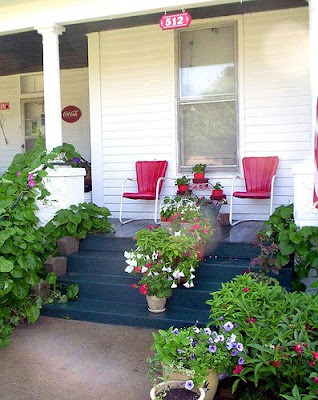 Looking at these pictures definitely makes me want to get outside and get the porch ready for the season ahead. 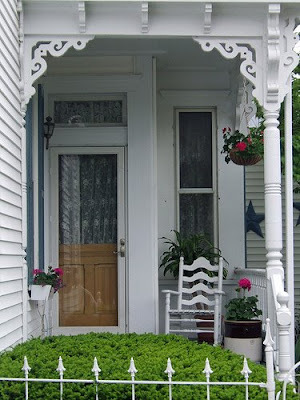 I hope the weather is nice where you are and that you make a little time for yourself to sit on the porch. oh, I am so happy I cleaned up my porch yesterday and it is finally warm enough here to go out and enjoy lunch and dinner today! I am soooo tired of snow too, we have ahd more this year than any year past!! 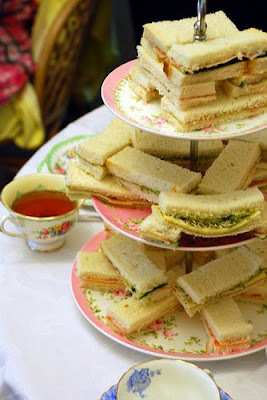 have a wonderful warm sunny day! 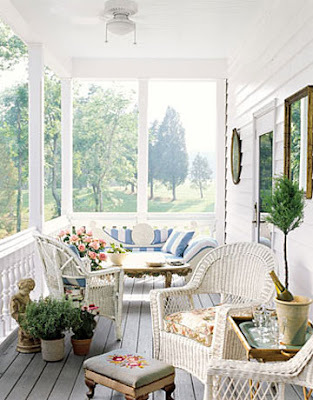 i have that country home issue with the slipcovered plastic chairs. someday when i conquer my fear of patterns, I WILL MAKE THEM! 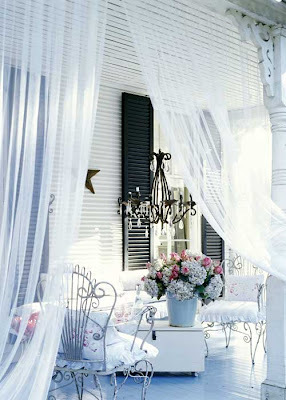 Ohhhhhhhh, I long to have a place like these someday, one can dream right? 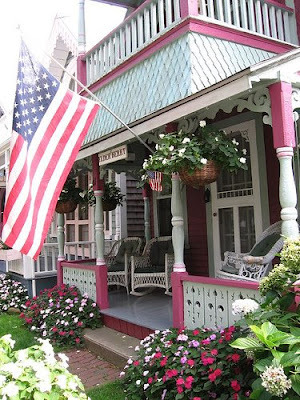 I read once that that's what's wrong with the world - not enough houses with porches. 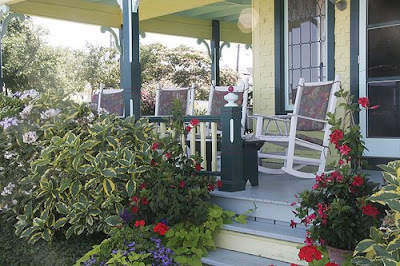 When you have a porch, you see what's going on in your neighborhood, with your neighbors and you show the rest of the world that this is your neighborhood and you care about it. 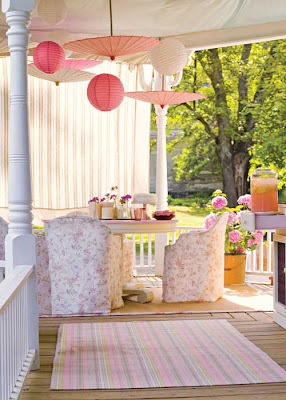 To drink lemonade, to say "Hello" to passerby's - and I tend to agree. I think we should rally and force everyone who builds new homes to have porches - and give a stimulus to older home owner to build porches! Oh well, one can dream - thanks for the great photos and the artwork you received is lovely! 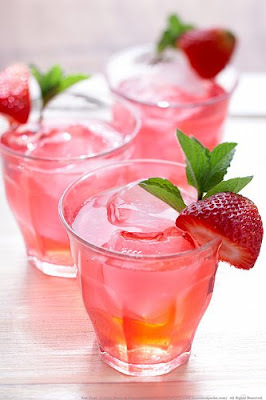 Ah, I can smell the flowers blooming in the yard and can hear the icecubes clinking in the lemonaide pitcher. 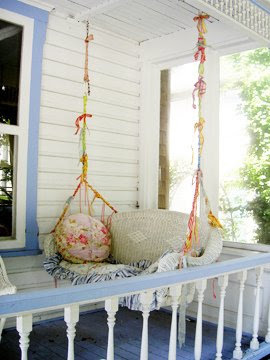 To rock on the porch in summer, BLISS! Thank you for the peak into summer!